After an incredible week of literary engagement, head over to the Bemidji Public library at 10:30 a.m. on Monday, June 20th for the Summer Reading Program Kickoff Concert. Singer and songwriter Paul Nye will be will be performing songs from his CD “Don’t Lick A Flagpole When It’s Cold,” as well as entertaining audiences with some new songs. Bring the kids and get ready for a fun romp of listenable & danceable original tunes. This event is for all ages. Intrigued? 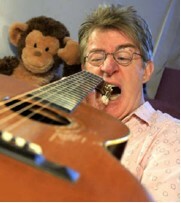 Be sure to visit Paul Nye’s web site http://www.paulnye.com/ to get a preview of Paul’s music and learn more about his work.